Because of some turbulence in real life (™) over the last few months, it’s been somewhat hard to concentrate on research. Fortunately the obligation of teaching sometimes exerts the right sort of psychological pressure to keep my mind on mathematics in short bursts. Concerning teaching I believe it was Bott who said (roughly): the trouble with teaching is that when you’ve done it you feel like you’ve accomplished something. But I think this is exactly wrong, and especially absurd coming from a gifted teacher like Bott. This quarter I’m teaching an introductory graduate class on Kleinian groups. It’s something I could teach standing on my head, and during a couple of the classes I half suspected that I was. But every time I teach something, no matter how “elementary” or “familiar”, I find that I get something new out of it. This time around I have been thinking about the Schläfli formula for the variation of volume in a smooth family of hyperbolic polyhedra, and the way in which it relates to some other well-known and important volume formulae relating to hyperbolic manifolds and geometry, especially in 3 dimensions. It turns out that there are some elegant and easy ways to derive many otherwise quite complicated statements directly from Schläfli; probably this is well known to experts, but it wasn’t to me, and I think it might make an interesting blog post. 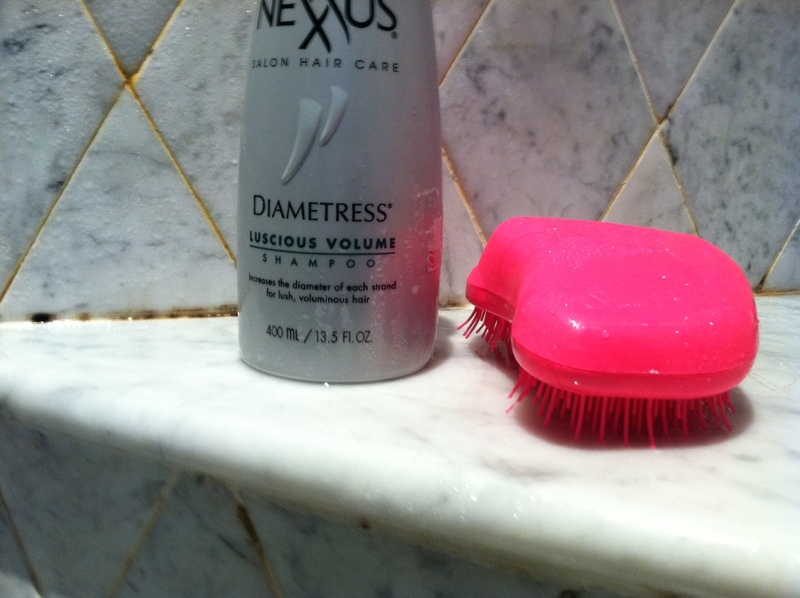 No doubt other readers with lush, voluminous hair like mine have had a similar experience. In two dimensions volume is area. For a hyperbolic polyhedron there is a beautiful relation between the area of and the angles at the vertices. This relation (due to Gauss) is cleanest to state when is a triangle, with angles , , . For an “ordinary” triangle, the angles should all be strictly positive numbers of course. 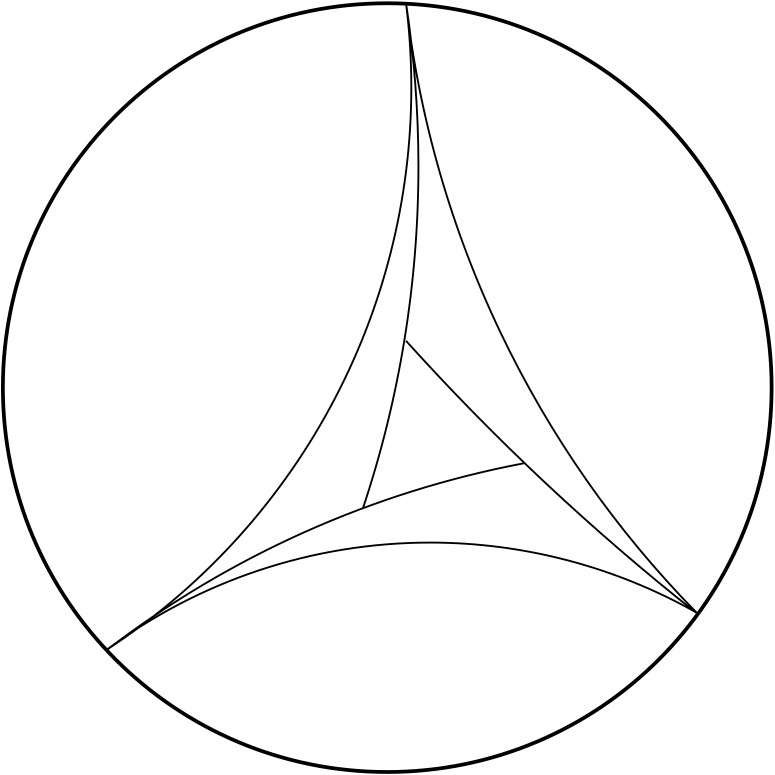 But in hyperbolic space it makes sense to consider triangles with some (or all) vertices at infinity — such vertices are called ideal, and a triangle with ideal vertices is called semi-ideal (if there are also some ordinary vertices) or ideal (if all three vertices are ideal). The group of isometries of hyperbolic space acts transitively on the set of distinct triples of points at infinity, leading to the remarkable conclusion that all ideal triangles are isometric. In particular, they all have the same area, which turns out to be . The following diagram shows how to decompose an ideal triangle into four smaller triangles — one with angles , and the other three semi-ideal with a single non-ideal vertex with angles , and respectively. So to determine we just need to understand the function . The next diagram shows how to decompose two semi-ideal triangles with angles and into a semi-ideal triangle with angle , and an ideal triangle. 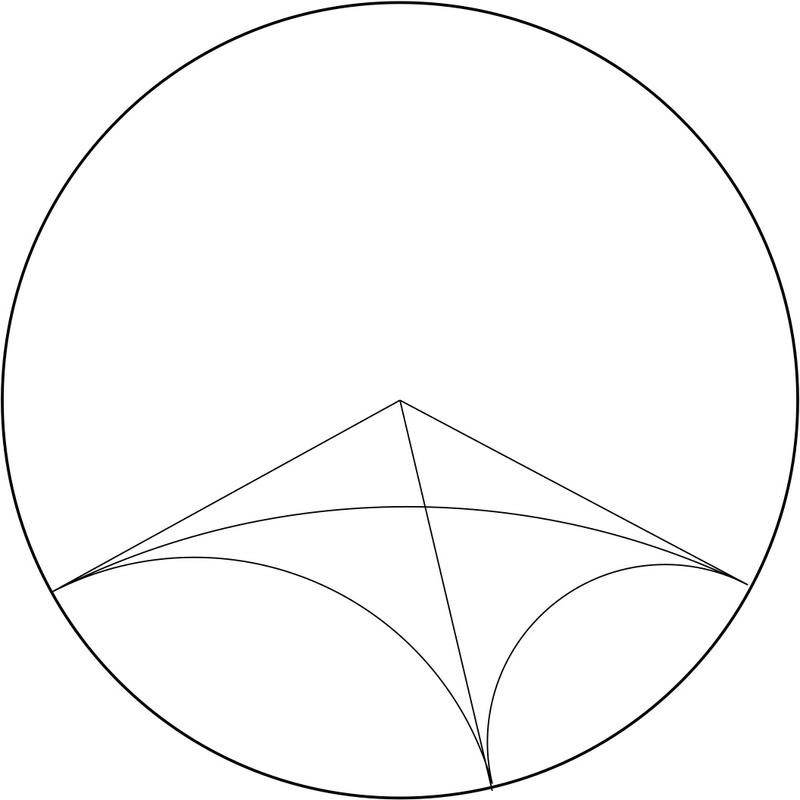 for a hyperbolic triangle with angles , , as above. If we agree that the “0-dimensional volume” of a point is 1, then the angle defect formula follows by integration, using the fact that an infinitesimally small hyperbolic triangle looks nearly Euclidean (and therefore has area close to 0 and angle sum close to ). There is a short and slick proof of this formula due to Milnor, contained in the first volume of his collected works; but I am not sure how much insight it really gives. Anyway, here is the argument. Proof of Schläfli formula: First, since both sides are additive under decomposition into pieces, it suffices to prove the formula for a simplex. Second, since both sides are linear in first derivatives, it suffices to prove the formula for a set of variations which linearly span the space of deformations of a simplex. An -simplex is cut out by totally geodesic hyperplanes, and the variations of each hyperplane are spanned by parabolic motions perpendicular to the hyperplane based at a point at infinity in the plane. where the second equality is Stokes’ theorem. and similarly for and . Putting this together the formula follows. qed. 2. Schläfli from Crofton via Hodgson. When I recently corresponded with Martin Bridgeman, I opined that Milnor’s derivation did not seem to really “explain” the formula, and I wondered aloud whether there was a more insightful derivation. Martin helpfully pointed me to Craig Hodgson’s thesis (which I read a very long time ago) where there is a derivation using some version of the Crofton formula. For those who don’t know, the Crofton formula is one of the most beautiful and useful in all of geometry. The simplest version expresses the length of a (rectifiable) finite plane curve in terms of the “average” number of times it intersects a random straight line. This should be interpreted in the sense that there is a natural isometry-invariant (infinite) measure on the space of straight lines, and intersection number with a finite curve defines an integrable function on this space. If is a compact hyperbolic polyhedron in -dimensional hyperbolic space, there is a natural isometry-invariant measure on the space of hyperplanes, and if is a hyperplane, the dimensional area of defines an integrable function with respect to this measure. The integral, up to a constant, is the volume of . Using this formula, one sees that Schläfli for -dimensional polyhedra follows from the same formula for -dimensional polyhedra, at least up to some constant (which can be determined by looking at an example, for instance). Turning this around, the angle defect formula inductively proves Schläfli in every dimension (again up to a determination of the constant). I would now like to explain some corollaries and easy derivations of the formula. The first is a weak version of Gromov Proportionality, a key step in modern proofs of the Mostow Rigidity Theorem. where denotes the fundamental class of in -dimensional homology, and where denotes the infimum of the sum over all singular -cycles representing the class . Since this quantity manifestly depends only on the topology of (in fact, only on its fundamental group!) this equality shows that the volume of any hyperbolic structure on is a topological invariant. For even dimensions, this fact is much more elementary, since it is a special case of Chern-Gauss-Bonnet, which says that the Euler characteristic of can be obtained by integrating the Pfaffian of the curvature form; for a manifold of constant curvature, this says that volume and Euler characteristic are proportional (and in even dimensions, neither are zero). A weaker statement is the observation that if is a 1-parameter family of hyperbolic metrics on then the volume is constant along the family. To see why this follows from Schläfli, just cut up into a family of geodesic polyhedra and apply Schläfli to each polyhedron. For every edge (codimension 2 face), the various polyhedra fitting around it have dihedral angles which sum to , so the contributions to variation of volume all cancel. The next application is a quick derivation of a famous theorem of Neumann-Zagier from this paper (with its famous math review by Jorgenson), for the leading order change in volume under hyperbolic Dehn filling of the cusp of a complete finite volume hyperbolic 3-manifold. Let denote a hyperbolic 3-manifold which is complete and finite volume, and has a single torus cusp. Let denote the meridian and longitude on the torus. Dehn filling is the operation of gluing in a new solid torus along the boundary of to obtain a closed manifold. The only relevant parameter is the slope on to which the meridian of the solid torus is attached; in terms of the coordinates this is a curve for coprime integers . One denotes the filled manifold by and says that it is the result of Dehn filling on . then we obtain (by taking metric completion) the structure of a cone manifold on with cone angle along the core geodesic. The error term comes from the fact that the volume is even in since . The quadratic form has an intrinsic definition as the length squared of the curve on the cusp torus, divided by the area of the torus. One last application is to give an integral formula for the volume of an ideal simplex. An ideal simplex has 4 vertices, and by an isometry we can put these vertices (in the upper half-space model) at for some complex number called the simplex parameter. Different (orientation-preserving) orderings of the vertices replace by or . We can therefore define a function to be the (oriented) volume of the ideal simplex with parameter . This function satisfies by what we just said, and , by thinking about orientations. This is not at all easy to derive directly from the definition. But it falls out effortlessly from Schläfli, by the following trick. (this uses the easy calculation that the dihedral angles along the edges and are and respectively). The two terms under the integral together sum to and we are done. This entry was posted in 3-manifolds, Hyperbolic geometry, Special functions and tagged Bloch-Wigner dilogarithm, Hyperbolic geometry, Schläfli formula, shampoo, volume change under Dehn filling, volume formulae. Bookmark the permalink. Thanks Ian! This sort of stuff is increasingly hard to find these days, when everyone has chucked out the contents of their filing cabinets (and usually the filing cabinets too). I discussed Schläfli’s formula during my seminar this semester, so I scanned Hodgson’s thesis (don’t tell Craig, since I didn’t ask his permission ;). Hodgson does it a bit differently, looking at the intersection with 2-planes instead of hyperplanes (so this doesn’t require induction, but does require a careful analysis of error terms). There is also a curious non-differential formula for volume one may glean from this approach. The area of a 2-dimensional cross-section is ∑(π-\theta) – 2π, so one gets a formula which is C ∑(π-\theta_e)l_e -2π Vol(P*), where P* is the dual polyhedron of all 2-planes that meet P, and C is some constant. I like the dual formula; probably the analog is easier to interpret in spherical geometry. Danny, this is beautiful. Thanks for sharing.